Azurea, the signature restaurant located inside One Ocean Resort Hotel & Spa, boasts an unparalleled waterfront location and innovative cuisine. The upscale eatery is helmed by executive chef Ted Peters, who creates a new menu each quarter that emphasizes seasonal, locally-sourced ingredients wherever possible. 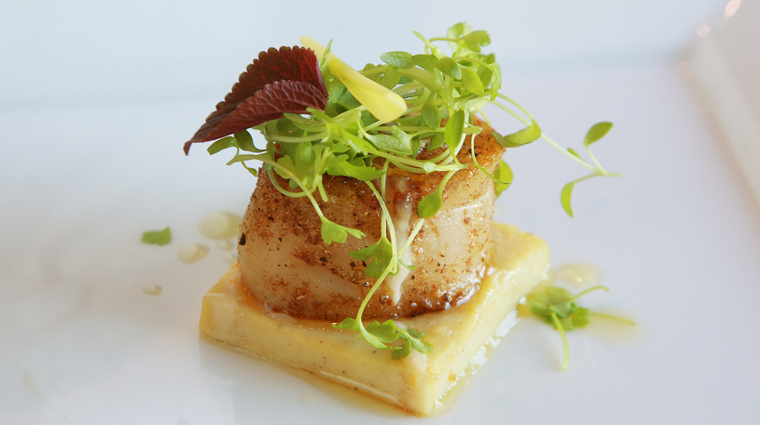 The restaurant’s “First Coast cuisine” menu is inspired by regional influences and well-balanced, flavorful choices. Dishes like cast iron seared jumbo lump crab cake, hand-crafted red beet ravioli and herb-marinated Florida mahi mahi are complemented by seasonal wines and cocktails with so much attention to detail, even the most discerning foodie will be pleasantly surprised. While you’ll undoubtedly find Floridian fare (cobia, mahi mahi, citrus, mangoes and more), you’ll see that the menu at Azurea spans Latin American dishes, the heart of Dixie and even Asia. It’s fusion food, for sure, but it doesn’t feel forced. One reason it’s so international? Chef Ted Peters has cooked his way across the globe, having wielded knives from England and France to St. John in the Virgin Islands to Miami and Washington D.C. and more. The bread service here is fantastic, with three types of freshly baked loaves and flat breads and four spreads like red pepper hummus, roasted garlic, fresh butter and herbs, and olive oil and balsamic. You’ll also get a flavorful amuse bouche to begin your meal and delectable mignardises upon its completion. If you want to dine outside, eat early. Not only will eating early ensure that you can catch the dazzling sunset over the Atlantic Ocean, know that the Forbes Travel Guide Recommended restaurant actually can’t illuminate the outdoor patio, as the lights will lure the local sea turtles away from their natural habitats. 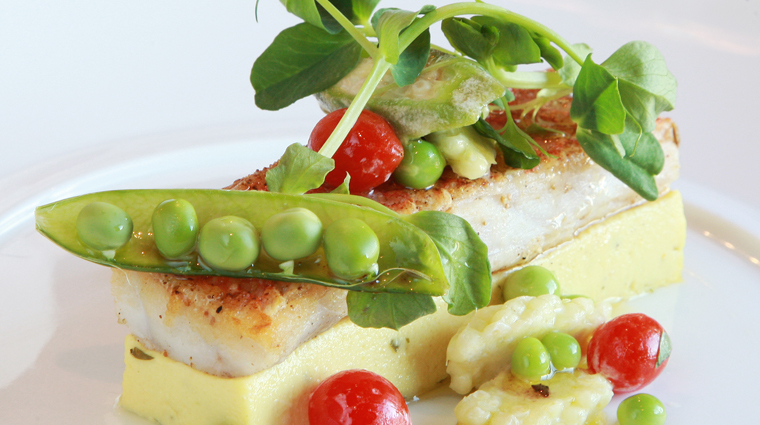 In addition to its signature appetizers, entrées, simply grilled items and side dishes, Azurea offers a five-course Adventurous Palate tasting menu which features items like pan-seared foie gras and yam gnocchi. It goes for $85, but the better deal is $105 for the menu with wine pairings. Cornmeal crusted soft shell crab. One of our favorite appetizers and a sort of Floridian riff on shrimp ‘n’ grits, this dish pairs a crunchy, cornmeal crusted soft shell crab with Tasso grits and piquillo peppers. Moist and flavorful, the jumbo seared blue crab cake is a must-order. Perched atop a bed of braised collard greens, this meaty crab cake is a great way to start your meal. You should definitely try some local fish while you’re down in Jacksonville, and cobia is an excellent one and here it’s simply grilled and served with a daily side, making it a sublime choice. If you’re hungry and, yes, have adventurous taste buds, definitely consider ordering the regularly changing Adventurous Palate five-course tasting menu, which runs the gamut from foie gras to yam gnocchi. We highly recommend adding the wine pairing, which will only set you back an additional $20. Mignardises come gratis at the end of your meal at the Forbes Travel Guide Recommended restaurant and we had to highlight the pastry kitchen’s excellent chocolate-making skills. We adored our tray of three chocolate bonbons, which were filled with salted caramel, a peanut butter-banana ganache and a cookies & cream filling. You might expect given its name, the interior design at Azurea is awash in vibrant shades of blue, turquoise, green and cream, creating a fun, contemporary setting that perfectly reflects its seaside locale. 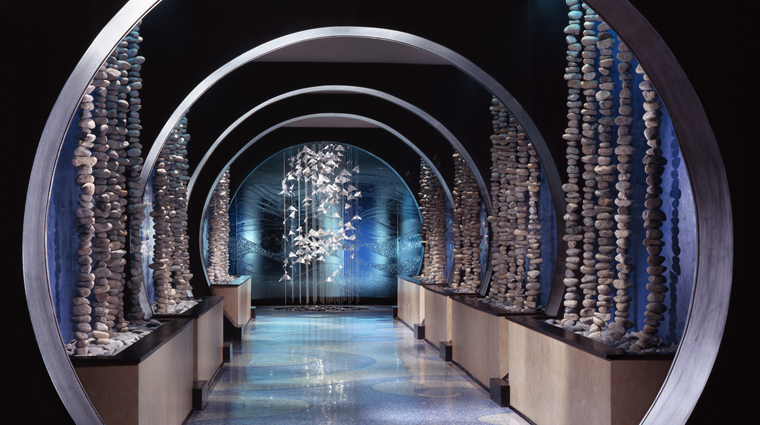 The entrance to the restaurant is notably impressive, a sort of long tunnel with a series of blue illuminated curved archways decorated with hanging rock sculptures. The entrance looks directly upon an azure blue glass etched wall, in front of which you’ll find a silver mobile that recalls a school of fish swimming in the sea. Once inside the restaurant, you’ll find a bright space with a wall of windows overlooking the Atlantic Beach sand dunes and surf while walls are painted an appropriately pulsing shade of blue. 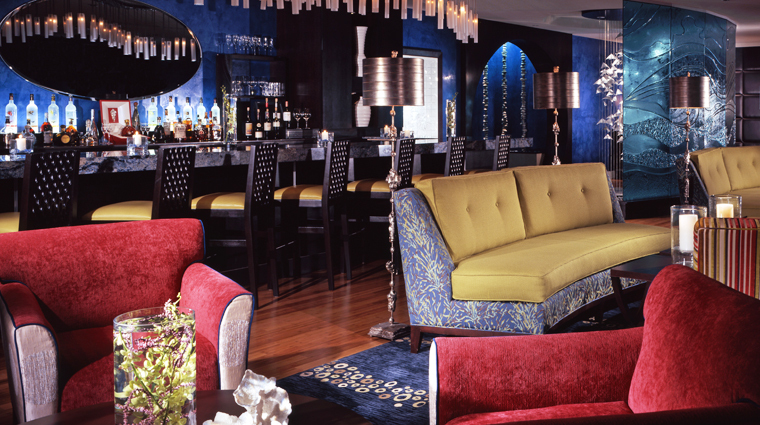 To the right of the entrance, you’ll find the bar and lounge area, filled with cozy red and green arm chairs and low, dark wood tables where you can enjoy a cocktail or two. 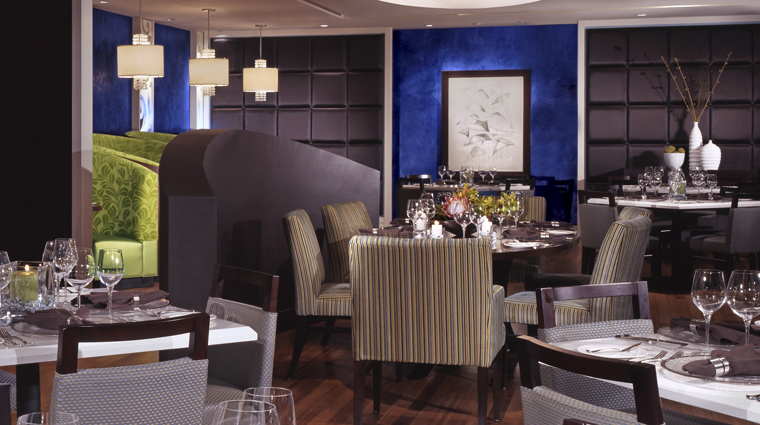 On the other side, past the hostess stand is the main dining area at the Forbes Travel Guide Recommended restaurant, also painted azure blue with white trim. Circular booths swathed in vermilion leaf-patterned fabric line the walls, offering you a more private dining area if you don’t want to eat at one of the square wooden tables dotted throughout the room. Flat cylindrical white light fixtures meanwhile hang overhead while light wood provides a clean look for the floor.